The Ultimate in Luxury & Hospitality! 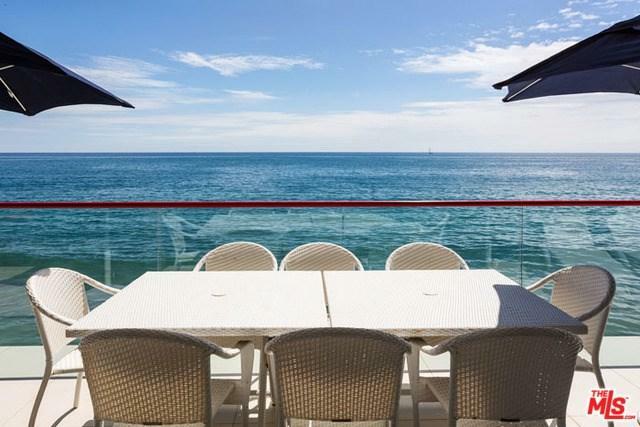 Ultra Contemporary oceanfront home on Malibu Cove Colony Drive. The 'SeaGlass' House is the most recent work of art by Architect, Norman Jarrett, also creator of the 'Malibu Dolphin' House featured on NBC's "Mansions and Millionaires". This masterpiece is designed for the most luxurious in accommodations, fully furnished w/gorgeous furniture & original art work. The main level has spacious living, dining & media areas, 2 fireplaces, a spectacular bar & elevator. Gourmet kitchen has stunning granite, custom Blue Star BBQ & dumbwaiter. Second floor has 4 large bedrooms w/walk in closets, mechanized Silhouette shades, baths w/rare onyx & granite. A full length barrel vaulted skylight provides natural lighting by day & star gazing at night. courtyard features a kitchen w/Lynx appliances and outdoor TV & fire pit. Crestron systems, WIFI, speakers throughout w/decks, radiant heating, A/C & filtered water. Direct beach access. No expense has been spared!